Boston, then Framingham, MA. Publisher: Eternal and Universal Brotherhood of [Holy] Mystics; Mystic Publishing Co.
1/1, January 1903. 4-12 pp., 10-25 cents to $1.00 a year. The Eternal and Universal Brotherhood of Mystics (EUBM) is something of a mystery, as are its principals and membership. In the journal it describes itself as follows: "The work of our twelve Mystic Degrees (one degree a month for one year), we can help you to gain Peace, Power, Harmony and perfect health of mind and body. The twelve degrees of our blessed Mystic Order are very simple and can be comprehended by any one. Working the degrees alone in your own home during leisure hours is a blessed work. The requirements for membership are: (1) The study of the Mystic Text Book, it being the official and authorized text book of the Order. The price of The Mystic text book is one dollar . . . . So, beloved, to have your name entered on the Eternal Sacred Roll of the Brotherhood and receive the Twelve Degrees (one sent every thirty days), you are required to order The Mystic Text Book and send One Dollar to help pay expenses of mailing, etc., $2.00 in all. . . . The work of the Brotherhood will do for you that which it has done for hundreds of others, and you will receive the indescribable joy and blessings of living the Mystic Life, which is the life of Peace, Power and Plenty." La France Antimaçonnique 26/13 (March 26, 1914): 151, while confessing its inability to trace either the EUBM or its journal, says that the purpose of the group was to lead "men to a superior and more progressive life, to a life of peace, power and abundance, to inculcate the oneness of all life and to defend whatever is true, pure, elevated, useful, and practical, no matter what its source." The journal itself has contributions by W.J. Colville, Mabel Collins, Walter DeVoe and others but regularly carries its own material on affirmations, vegetarianism,reincarnation, Universal Love, Divine Mind, charity, the Mystical Union with Christ, and the like. Each issue carried a Message from the [unidentified] Patriarch ("Everything in the universe is thine," and the like). None of the principals of the Brotherhood is identified but there are regular contributions by Pauline E. Sayre, Nellie Whipple Fawcett, and others, who may have belonged to the group. The journal thus appears to have been yet another Christianized version of New Thought, but an article from the Boston papers in 1908, reprinted in Katherine Tingley's Century Path, adds to the mystery by saying that the heads of the Brotherhood were "Blissful Prophets," whose regular teachings "enable members to accomplish wonderful things." The only Blissful Prophet at the time was Bhakti Seva who appeared regularly in the Magazine of Mysteries and wrote The Hindu Book of Astrology and, with William E. Towne, "Hurry, Worry, Scurry, Flurry Cured." He seems an unlikely candidate for head of the EUBM but someone writing as "The Blissful Prophet" contributed regularly to this journal and it may have been Bhakti Seva. If it is, the reinvention of the platitudinous astrologer as the centerpiece of a Christian brotherhood that lasted at least a decade is remarkable. One of the organizations being touted by the Magazine of Mysteries at the time Bhakti Seva was contribution to that journal was the Universal Brotherhood of Ancient Mystic Adepts, which may have contributed to the formation of the EUBM. The article in Century Path goes on to say the EUBM "practices long continued suppression of the respiration, inhaling and exhaling the breath in a particular manner, sitting in 84 attitudes, fixing the eyes on the tip of the nose and endeavoring by force of mental abstraction to unite themselves with the vital spirit which pervades all nature . . . ." Every day at noon and every night the "Holy Spirit and the angels and mighty mystic adepts" unite to help students enrolled in the Brotherhood's sacred roll. The Brotherhood was said to have a colony on the banks of the Penobscot in Maine. Assuming that any of this reflects the inner teachings of the Mystic Text Book, however, it has left no impression on the written record, and the group has vanished largely without trace. The Mystic Publishing Co. also published "occasionally" a free journal called the Mystic Voice, and in every issue advertised its preferred stock at $10.00 a share, offered to "those only who are interested in psychic phenomena and are earnest seekers after the truth. There are multitudes of people, especially women endowed in varied degree with psychic powers, and it is to those we appeal." NYPL. 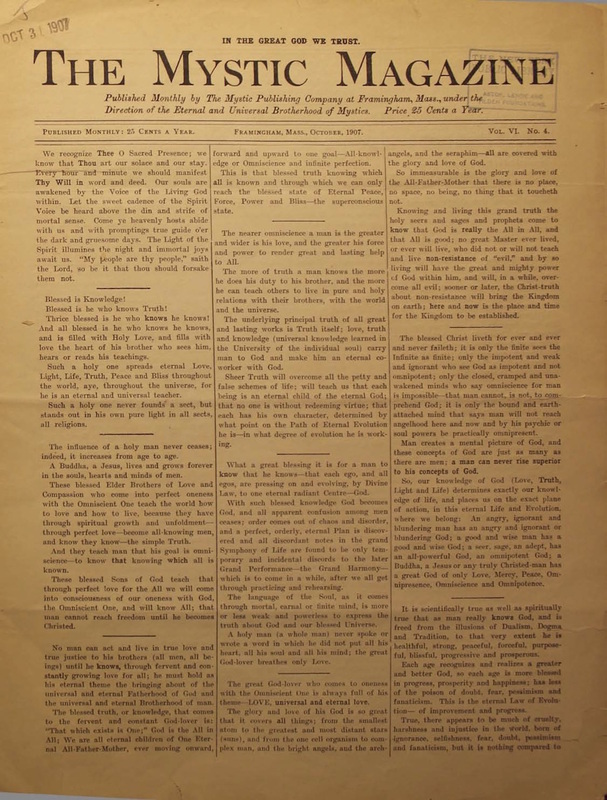 Mystic Magazine V7 N3 Mar 1908.